It is hard to describe a sonic boom, like something hitting the house or the house exploding outward. It is however very shocking if you aren’t expecting it. Well the shuttle landed in California, so we got to enjoy the sonic boom. It did get my heart going on an otherwise lazy Sunday afternoon. 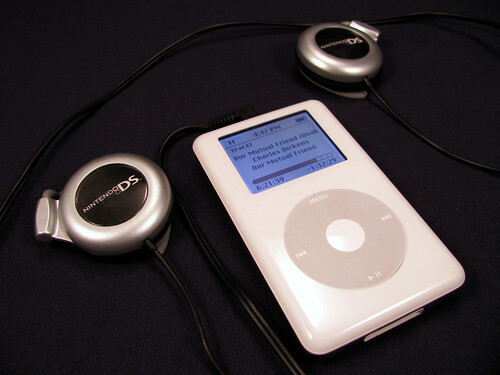 As for the photo, I feel I must post a photo, it is of a very outdated classic I-pod and Nintendo DS headphones. Lately I have been using both to listen to audio books while I sew, or do just about anything around the house. I think I am getting more crafting done, since it keeps my mind occupied and the tedious parts of any project pass without the frustration that use to stop my progress. Even books I have read before are given a fresh perspective when read aloud. I think it is worth mentioning to other crafters, since it has been such a help to me. It is also good for my moods not to listen to the news so much, which was my previous habit. Now for the DS head phones, they are very comfortable. I wouldn’t have known this unless I had wanted to get a family dog. My husband and son were so against this idea that I was given a Nintendo DS and Nintendogs instead. It is not the same as having a real dog, and I quickly decided that a virtual dog is not something I want to feed and play with daily. I do like the head phones though, and recommend them if the ear buds are uncomfortable. This entry was posted on Monday, December 1st, 2008 at 3:00 am and is filed under Tools. You can feed this entry. You can leave a response, or trackback from your own site.